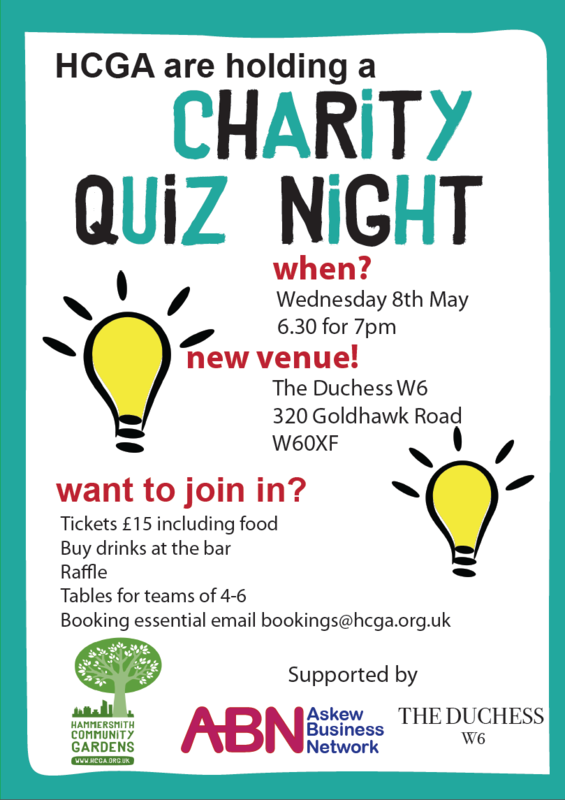 Book early for the upcoming charity quiz night organised by Hammersmith Community Gardens Association (HCGA), supported by Askew Business Network and sponsored by The Duchess W6. It promises to be another great evening! What’s more, all proceeds go to HCGA, which manages several community gardens in Hammersmith and Fulham. Projects include: conservation training schemes, volunteer gardening sessions, environmental play schemes and environmental education in local schools. Email bookings@hcga.org.uk to register your teams of four to six. Spaces are limited so book in advance. £15 per head including food. Please arrive for 6.30pm, ready for a 7pm start.